Install a VapourTrap Filter to reduce harmful VOC vapours inside your safety cabinets. 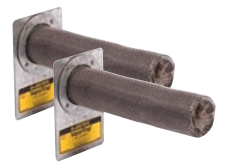 Activated carbon filter medium contained in a stainless steel mesh cartridge adsorbs the volatile organic chemical vapours from cabinets storing flammable liquids. Sturdy 4-in x 5-1/2-in (102-mm x 139-mm) magnetized base offers flexible placement anywhere within the cabinet. Date notation area on label serves as a reminder for replacement; life cycle varies based upon vapour types and concentrations. Note: Due to variables such as the chemical itself, its purity or its vapour pressure, temperature, humidity, charcoal age, etc., it is difficult to estimate VOC vapour adsorption rates. The Justrite VapourTrap Carbon Filter is not intended to be used as a substitute for using safe closed containers as required by OSHA and the EPA. It is important to clean up spills and residues from the cabinet and containers.